Have you ever wondered why most people are not successful in Real Estate or achieve very limited results? All Real Estate techniques and strategies have a learning curve. That being said, after you have grasped the strategy or the technique you want to implement - what now! The easy part was learning about the strategy, now comes the hard part which is Negotiating the deal. You can go to all the seminars, buy all the books and tapes on real estate investing and still fall flat on your face or come out on the short end of the stick - costing you time and money. OK, OK if rah rah seminars, boot camps and positive thinking don’t work, what does? What's the SOLUTION? There is a common sense, success method that can achieve remarkable results in a reasonable time frame and it¹s called Negotiating For Profit. This method literally allows the user to leap ahead and learn quickly and become profitable, thereby eliminating all the usual wrong turns and costly mistakes that others make. The secrete to being successful in Real Estate or anything else for that matter is knowing how to negotiate! No more fear of picking up the phone! Build confidence like a seasoned investor. Negotiate anything on your terms! I have teamed up with a leading Hollywood Clinical Hypnotherapist and have created the Negotiating For Profit CD. This CD is not a bunch of psycho babble or positive thinking jargon or subliminal programming, but rather a scientific based approach used in many medical facilities across the country to transform you into a world class Negotiator. 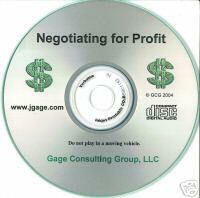 After using this CD you will have the confidence and strength to be able to Negotiate anything on Your terms. I have used this CD successfully with my mentoring student’s with great success; now I’m offering it to you for less then a visit to your local gas station – this can and will change your negotiating life! Listen to it at night before going to bed for three weeks. It is important that you listen to this CD every night during the 3 week period; if you miss a night, add that night onto the three week period. Thereafter, listen to it at night as needed for reinforcement. The CD will relax you and when it’s over, allow you to fall into a natural sleep. Most people, after listening to the CD a few times, are not aware of what is being said on the CD past the first few minutes -this is Normal. Rest assured that your subconscious mind is still receiving the positive messages for change even while your conscious mind is unaware. Note: This CD should not be used in a moving vehicle.